Did Lightning Doom Air France Jet? The lightning and turbulence that may have hit an Air France jet flying from Rio de Janeiro to Paris are rarely the cause of plane crashes, analysts say. But they note that rough weather may have triggered a series of malfunctions that led to the disappearance of the jetliner. Chief Air France spokesman Francois Brousse suggested the plane could have been struck by lightning. But most experts say lightning doesn't usually bring down a modern airliner, unless it coincides with other factors that contribute to the accident. "Planes are built with lightning strikes in mind and are struck reasonably frequently," said Patrick Smith, a U.S. commercial pilot and aviation writer. "I've been hit by lighting in my career a number of times, which at worst resulted in a superficial mark on the outside of the plane," Smith said in a telephone interview from Sao Paolo, Brazil. Lightning strikes can be catastrophic on the ground, but in aviation they are a daily and uneventful occurrence, reports CBS News correspondent Nancy Cordes. That's because jets like the Airbus 330 are built with materials that shed lightning charges and are equipped with redundant electrical systems - if one shorts out, another takes its place. "It's a little bit of an adventure for a moment because it's like a flashbulb going off in your face," Jack Casey, COO of Safety Operating Systems, told Cordes. "But beyond that, that wasn't a big concern for us." Aviation safety statistics indicate that each large passenger jet - such as the Airbus A330 - is struck by lightning about once every three years on average. Regional aircraft however, which fly at lower altitudes, are hit more frequently - about once a year. Although lightning may have been a contributing factor in a handful of accidents since World War II, only one major crash was attributed directly to a strike. In 1963, a Pan American World Airways Boeing 707 exploded in midair when its fuel tank fumes were ignited by lightning. Since then, aircraft electronic components have been hardened to withstand electric pulses of that magnitude, and new systems have been designed to prevent sparking in fuel tanks. About seven hours after taking off and flying through the night over the mid-Atlantic, the pilots of the Air France Airbus reported that they had encountered an area of intense cumulonimbus activity, part of the massive thunderstorms that regularly batter the world's equatorial belt. To avoid structural damage, both military and civilian pilots use standard onboard radar to maneuver around the thunderheads, which are characterized by electrical discharges, hail and high winds. The mid-Atlantic region is where most hurricanes that hit the Western Hemisphere originate, and this is the beginning of the storm season. Thunderheads in the area can tower up to 60,000 feet, making it impossible for airliners to fly over them and forcing them to make long diversions. It remains unclear whether Flight 447 took evasive action to avoid the area of heavy turbulence. 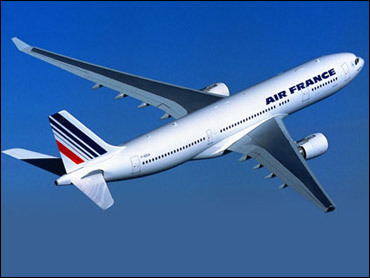 Air France reported that the aircraft's ACARS (Aircraft Communications and Addressing System) - a digital datalink that automatically transmits service messages from the aircraft to ground stations - messaged the company's headquarters regarding a problem with the aircraft's electrical and pressurization systems. Former NTSB chairman Jim Hall said that, since the A330 is widely used in international travel, it was vitally important to locate the black boxes as quickly as possible and analyze what happened to Flight 447. "At this point accident investigators can't rule out anything," he said. "But these aircraft are designed to withstand almost any lightning strikes or any level of turbulence." Although aviation experts stressed it was much too early to speculate about the causes of the crash, they noted that the accident was most likely caused by various factors that combined to cause a catastrophic chain of events. "It sounds like something that evolved into a problem, not something that happened instantly," said Bill Voss, president and CEO of Flight Safety Foundation, in Alexandria, Virginia. "It would appear that their systems were degrading but we don't know why they were degrading." Smith said that that if the crew was forced to ditch the A330 in the ocean at night in stormy weather, "the outcome would not likely have been a good one." "It would be nothing like landing that Airbus at midday in the Hudson river, a completely different scenario," Smith said, referring to the successful Jan. 15 water landing of a US Airways Airbus A320 in New York.